On a recent visit to the bird store I came across a Jardine's Parrot I recognized from last time. It has remained unsold for a while and is around 6 months old already. Besides the fact that parrot sales are down during this terrible economy, you could say that Jardine's Parrots look rather dull in front of all the Sun Parakeets, Cockatoos, and Macaws. To make matters worse, this little Jardine's Parrot didn't even know how to step up. 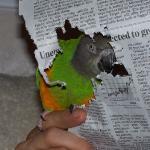 When I reached my hand into the tank housing the two available Jardine's Parrots, all havoc broke loose. The two terrified parrots fled my approaching hands. I was unable to get one out without a bite. However, once I got a hold of its neck all matters were settled. With the restraint of my parrot hold, the Jardine's struggle was over while I protected myself from additional bites. 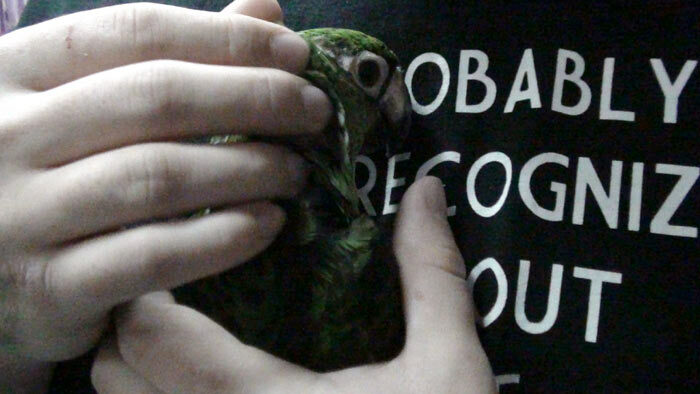 Within minutes the parrot calmed down and sweetly cuddled as I held it against my chest. As time progressed I was able to hold a looser grip on the bird with less fear of biting or fleeing. I was able to pet it on the head and neck and hold it any which way. I was surprised to find out that the bird did not know how to perch or step up. Well it was obvious in the tank that it didn't want to step up, however, it wouldn't step up outside of the tank either. While I held the bird in my hands it stayed calm but would get very uneasy when I tried to let it perch on my finger. The Jardine's Parrot became scared when I approached with a finger to ask it to step up. Worse yet, if I pressed my finger toward its belly to edge it to step up, it simply knew not what to do. The Jardine's Parrot simply did not know how to lift its legs to step up to perch. Having gone unsold for so long, the poor little bird never learned to perch while living in a flat bottom tank. This is good for the younger birds but they are not expected to go unsold for this long. It had trouble perching on my finger because it curled its toes instead of wrapping them around my finger. I had to straighten the toes out to show it that it can grip my finger better that way. Although scared at first and unable to step up, this Jardine's Parrot turned out to be really sweet. As long as I held it close, it did not try to bite and let me pet it all I wanted. I carried the parrot around the store with me for nearly an hour. The bird was starting to get the hang of perching. However, when I put it down on a perch to poop, it would not step up when I tried to take it back. Yet when I grabbed it with my hands to pick it up, it did not protest one bit. I was amazed that here was a bird that preferred to be forcefully grabbed to being in control and stepping up. This is quite the opposite of most parrots around though this is not the first Jardine's Parrot I have made this observation with. I began working on the basics of step up by using a finger to pry its toes off the finger it was perched on. I slowly lifted that foot until it would have to pick the other foot up to follow. I also used a slight disbalance in the hand it was originally perched on by tipping it downward while offering the rock solid finger to step onto. I began adding a reward to the process as well. What reward could I possibly use on a bird I do not own, that isn't hungry, and no training supplies to use? I used stability, attention, vocalization, and height to reward the Jardine's Parrot for stepping up. First I lowered the hand it was perched on to the height of my stomach. Then I offered my other hand slightly higher. The early step ups were forced to demonstrate to it what to do but soon enough it was picking its foot up on its own to step up. Then as soon as it stepped up, I lifted it up to eye level and made excited sounds. This was positive reinforcement based training at work here and it shows that not all positive reinforcement needs to be food. This method proved to be positively reinforcing because the Jardine's Parrot was more readily stepping up with each trial. Positive reinforcement is measured by its affect on behavior and the behavior was increasing. Success. For a parrot unaccustomed to perching or much exercise, I'm sure this was challenging. I gave it breaks longer than the actual training session bits for scratches and cuddling. Then I would ask for a step up again and it would do it. Before the end of our short interaction the Jardine's Parrot would simply pick up its foot on the sight of my approaching finger (almost like wave) in anticipation of stepping up. The bird even stepped up for other people and let others pet it as well. Besides stepping up, I also managed to teach it petting etiquette in the time I held it. I only pet its head if it would let me hold its beak (like I do with Truman). It enjoyed the petting so it did not mind being held in this way. There were children attending the store who were disappointed they couldn't pet the other birds so I carried the Jardine's around and let them interact with it. One lady commented that it's a great idea to hold the bird's beak during petting that way as I let her daughter pet the Jardine's. You don't want the children to get scared of parrots from getting bit and you don't want the parrots to learn to bite. So prevention is key. Unfortunately I wasn't able to convince anyone to buy the bird and I surely couldn't buy it either. However, now that the bird is a bit more used to hands and knows how to step up, it will have a better chance of finding a good home. Someone will become entranced by this parrots sweetness and will have a cuddlebug on their hands. The store owner was impressed and grateful that I tamed the bird a bit for her. She told me to leave the bird out front to showcase it for buyers. Even if you don't intend to buy another parrot ever again, it's still a great experience builder to go to a store, rescue, and breeder to handle some parrots. It's win/win for everyone. Most stores/rescues are too busy to give all their birds sufficient handling time and will appreciate an experienced/caring parrot owner to spend time with their birds even if they aren't buying. By handling other birds (possibly bigger or more aggressive) it will give you greater confidence in handling your own. The eventual buyer of the bird wins too because they will acquire a more socialized bird that is accustomed to handling. The biggest winners of all though are the birds themselves. They can really use some love and attention. 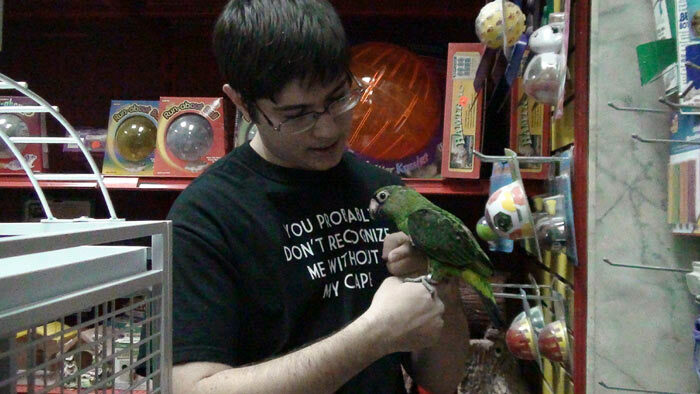 Here's a brief clip at the bird store and how I was working with the Jardine's Parrot. I find that the friendliest birds are always the Australian species. Cockatiels, budgies, cockatoos, kakarikis, lorikeets, bourke's etc. But I've had experience with these kinds of birds. I think you're just more comfortable with the poi's, and they respond to that. Animals are really good at picking up feeling and emotions, so maybe that's it. Just my opinion. Any ways, cute video. I love baby birds. What a great video! That's such a good idea to help those birds in the stores to become more socialized. I love the "beak technique" you use to pet them. Awesome idea! You really have a way with parrots, and I think that they all sense that too. One of the bird stores in my area has their babies in tanks too, but they place branches in the bottom so that they get used to perching. Does the store you visited do that at all? You're either biased or some sort of poicephalus whisperer. I completely understand... I'm biased too. 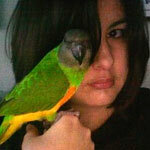 But, of the birds I worked with, Toos were always by far the most friendly with everybody, followed by conures. The Caiques I raised were also extremely friendly with everybody. Hmmm... maybe I was just a good hand feeder and nurturer? But, aside from all of that, you have to agree that the Jardine's is one of the cutest parrots! Right? As you know from meeting me, I have a huge soft spot for Jardine's...my own three Jardine's are all very very affectionate birds who love headscratches. When I worked at Denise's Parrot Place in Seattle, after two years they finally got a baby Jardine's in...and it was interesting seeing her develop and interact in the store. She came in with a Meyer's, and the Jardine's developed far more slowly...more 'needy' of interaction and handfeeding for a longer period of time. I called her Rhonda and she did get adopted shortly after I moved to Arizona, and heard her new owners, a young girl and her mother, absolutely adored her. She was somewhat bitey initially, but also very loving and cuddly if she felt secure. I do a similar thing when interacting with my grey, Nigel, as far as his beak...Nigel always wants a kiss, but he is slightly unpredictable about nipping, so he has learned to get his kiss through my hand...actually I do that in the video post when I step him up in the Oasis grey aviary. A hand bite over a facial bite I'll take any day! Sad to hear that this older baby Jardine's is being kept clipped in an aquarium without perches and consistent handling!! Most bird stores I visited on the east coast are set up like this. Denise's in Seattle is set up differently...they do still clip their babies, but all the birds are kept in cages off limits to the public, where you can see them behind a glass window. There are three tabletop and one floor stand that are available for babies to be out on during the day in the main part of the store, and also two hanging orb gyms in the backroom where the public can see the birds through a window from shopping area. So we would daily get all the birds on to the gyms in rotating shifts. It was good because babies learned to step up for -all- the store employees (usually at least five people, often male and female), and had a chance to be out in front and meet people daily for a limited time. OR to be on the hanging gym (which as a baby, my Nigel loved...he would get it whirling around as he flapped). We also were fairly limited on the number of birds we could have for sale in the store, since very few shared cages....the cockatiels did on the counter, and otherwise we had room for only around 20 parrots. They did get to interact with other birds when on the playstands, but overall they learned as they were weaning to play by themselves and interact with people. Babies at our store therefore continued to be handled daily even after they were done with handfeeding...they would step up to come out of their cage to go to a gym, then step up to go back...and if any one was interested in a bird, they would be stepped up again to come out and interact with the visitors. So being scooped up from a bin or an aquarium was something that didn't have to happen as they matured, and they learned to balance and play on all kinds of perches and surfaces and always had toys in their cages, initially stuffed toys while being handfed when they were still with nestmates. I had one male Eclectus baby who was my buddy at the store, and Gumby would 'decide' when he was done interacting with a visitor...if he was done, he would flap down to the floor and walk around the corner through the 'employees only' door back to me and underneath the hanging gyms. I was afraid he wasn't going to get a home, but fortunately right before I left the nearly two year old eclectus got a great home and was very happy with his people. It was interesting, very few people were interested in a green bird like a Jardine's, and Eclectus females sold so much faster than the males, regardless of temperament. But of course we always had people coming in to buy African Grey babies, not a problem.